Let's all face it, sickness is a part of life. There are no rules however on how long we have to stay sick. With the the constant up and down in the weather lately my family has been a bit run down and not feeling well. 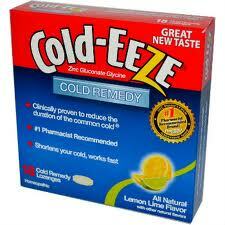 Lucky for me I had a great product waiting in a box ready to try, Cold-EEZE to the rescue! Now i have tried other zinc supplements before when sick and well they were very zinc tasting. I was able to try the Cherry Oral Spray and the Lemon Lime Lozenge. My husband laughed because of course even being sick my inner fat girl popped right out. The Cherry Oral Spray tastes very much like a cherry icee. Which made it very pleasant to take! The lozenge had a much lighter taste but was still very good. I made sure to take them as directed, once every 2-4 hours, and it really seemed to perk me up quite a bit. The Oral Spray was not only great tasting but fast and easy to use! Just 2 sprays and you are ready get get back to your day. I was even able to complete my Relay for Life and wake the next morning not feeling ill. I'm going to make sure to keep a couple of these around for future use. That sounds like a great product. I don't know that it is available here in Canada yet:( I took a look at their site. If anyone is interested, they have a printable coupon for $2.50 off the oral spray. I love the idea of a spray vs. swallowing medicine! I have alwayas wondered about this product, I could sure use it now! I like that the have a spray option and have always been a fan of their Lozenges. 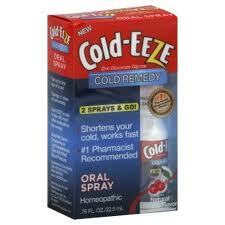 oh spray for cold-eeze?! We loved the original they work so well! Will look into the spray! This is a great product. It is one of my favorites. It works! Wow! I've never heard of this before. I know some people that would really like to try this. That sounds great! I didn't know there was an oral spray. Thanks for the review!